Holeshot Bragging Rights: If maximum power is required, there is no other way but the 450 XC-F. The compact SOHC (single overhead camshaft) engine delivers explosive but controllable power and shares 95 % of its parts with the championship winning 450 SX-F. 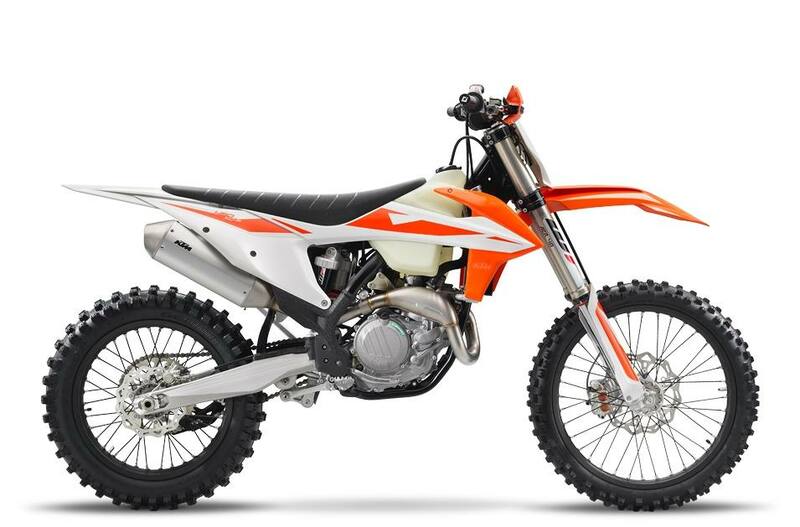 The hugely successful KTM 450 XC-F powerhouse has extremely compact dimensions, strong performance throughout the rev range and a low weight; this is the lightest 450 engine on the market. But that doesn't mean it's not a heavyweight in terms of muscle. Fitted with a single overhead camshaft cylinder head and the latest electronic fuel injection, it pumps out unrivaled horsepower. With KTM's engineers working tirelessly to increase the ultimate READY TO RACE machine, this powerhouse has the latest engine management technology on board and confidently shoots both amateurs and pros to the top of their time sheets. Cylinder head: Inside the SOHC cylinder head, an overhead camshaft controls four ultra-lightweight titanium valves via extremely rigid rocker arms, which are DLC-coated on the intake side. A configuration like this allows engine speeds of up to 11,500rpm; a baffling figure for a large displacement thumper. Lateral brackets made of aluminum allow an efficient fixation of the engine to the frame and contribute to the bike's featherweight feel. Crankshaft: The KTM 450 XC-F's crankshaft utilizes a short connecting rod, which makes for an overall compact and lightweight engine with a snappy power delivery. A plain big (bottom) end bearing with two force-fitted bearing shells runs directly on the crank pin. The necessary oil feed for this bearing is ensured by the engine's pressurized lubrication. This design is a decisive benefit in terms of the crankshaft service interval, which can be lengthened due to the plain bearing. So just pin it, all day long. Transmission: The KTM 450 XC-F uses a lightweight 5-speed transmission with gear ratios that are perfectly matched to the power delivery of its large displacement engine. The 1st and 3rd gears are treated with a special surface coating for better reliability. An advanced ´No Dirt´ gear shift lever design prevents mud and sand from blocking the joint of the lever and guarantees trouble-free shifting. All 4-stroke engines are fitted with a gear position sensor, giving the option of different engine characteristics for each gear. For 2018, the transmission shaft gets a stronger shifting star and a C4 bearing that has a bigger overlap in the case. This guarantees better reliability even in extremely tough operating conditions. Engine management system: The state-of-the-art Keihin engine management system with electronic fuel injection features a 44mm throttle body. Thanks to its unique injector position, the engine's response is instantaneous. And to make life even easier, separate systems for cold starts and idle adjustment await you. The lightweight control unit features a unique traction and launch control system for lightning-quick response when the gate drops and maximum grip thanks to different maps that sync with to the gear you're in. It's also possible to unleash an even more powerful mapping via the handlebar map select switch. 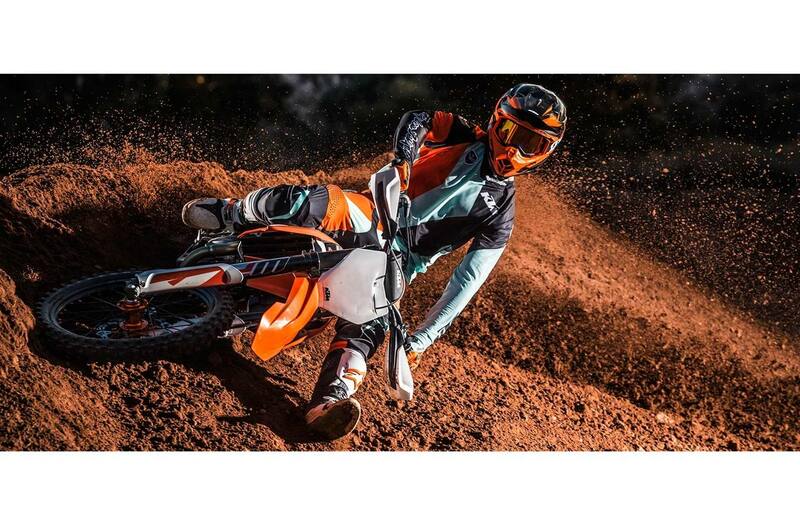 E-Starter: Like all KTM 4-stroke motorcycles, the KTM 450 SX-F is started at the push of a button - a priceless advantage when you're on the clock.